I wore a pastel, floral dress with an A-line skirt and trimmed cutouts along my waist on the first day of freshman year. Under my arms, I gripped onto hot pink padding which saved me the risk of bruising from being on crutches for six weeks after ACL reconstruction surgery. The token image of an oversized backpack with zippers that hardly close weighed me down as I hobbled down the halls. This made me feel as if I appeared to be the poster child of a first-year student. I topped the signature look off with a smile from ear to ear. With one year under my belt, I walked into sophomore year thinking I knew everything about high school. I strutted down the halls on the first day with a newfound confidence in myself- I wasn’t at the bottom of the school’s social hierarchy anymore. Yet, reality came into play when it hit me that I wasn’t even halfway through high school and classes became much more onerous. Junior year. Upperclassmen. The halfway point. One more year until graduation. The final ‘push’ of hard work and all-nighters. Having, once again, underestimated my workload for the year, I immediately found myself overwhelmed. As my grades began to slip, I determined that there are four types of students; those who work hard and are naturally brilliant, those who have the capability to achieve high standards, but need to work hard, those who are naturally brilliant and put no effort into academics, and those who don’t care overall and their grades reflect their effort. I found myself to follow the patterns of option number two. Now we have reached the final countdown until we walk down the steps at Caramoor at graduation. The first quarter of the year was the most stressful of my life, filled with deadlines, paperwork, portfolios, auditions, visits, interviews all on top of the regular workload within the classroom. Last year, seeing the kids you looked up to and grew up with being accepted into college is one of the most complicated feelings a person can face. On one hand, you feel like a capable and independent adult ready to follow in their footsteps as fast as you can. But on the other hand, you feel your childhood lingering and your sentiment growing for the students you have had around you since you were young. Now as acceptance letters begin to flutter in, and the all too familiar Facebook statuses posted, you enter a phase of a sort of nostalgia that nobody except seniors could understand. As we approach second semester, (33 school days from today,) The contagious epidemic known as ‘Senioritis’ begins trolling the halls far too soon. 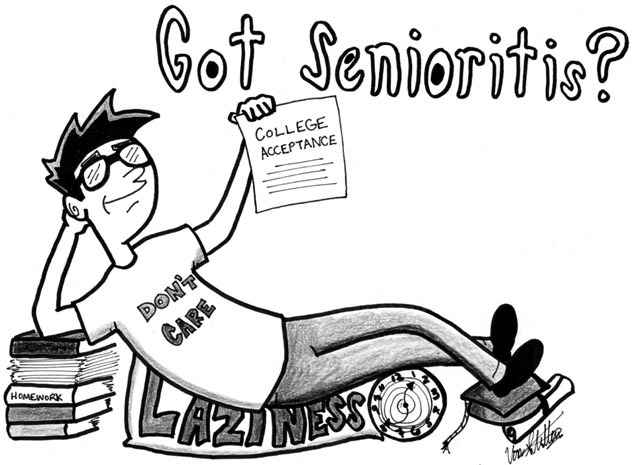 This time for seniors is a feeling of relaxation and a moment they can finally get to enjoy high school without worrying about academic duties. Yet, as we still fall short of the January 31st date to begin second semester, we fail to remember that our days walking the halls of John Jay as current students are limited, and that as difficult as it may be, we must cherish our time here. I sit in my bed each night, sleep deprived, of course, reminiscing on the events of the day and dreaming about the near events in the future. I shift my spine to feel a pencil has taken refuge beneath my sheets, so I turn to see my textbooks scattered across the floor and my backpack lying on its side beneath my desk chair. As I tuck myself under my blankets after a painfully lengthy day of high school followed by hours of homework and extracurriculars, I begin drifting off to sleep. I recall the floral dress, the plush-padded crutches, as I forget the 33-day countdown, and smile from ear to ear.